Instant Car Donation was founded with the goal of bringing donors and local charities together with an efficient and pleasant process. You can focus on deciding which of our respected charities is right for you instead of worrying about difficulties of researching how to make a donation. After your free pickup, we will assist you in recieving the best tax benefit possible for your generous gift. We take pride in helping smaller charities easily receive car donations, bringing people together while helping support those in the Pueblo, Colorado community who need it the most. Here are some of our favorite charities in the Pueblo area. We have made sure each of them are eligible for tax deductions when you help your local community by donating your car. Your values and choice can make a difference. The NRA Special Contribution Fund provides education and training in firearms safety, marksmanship, and wildlife conservation via the NRA Whittington Center, which covers 33,000 acres near Raton, New Mexico. Founded in 1973, the Whittington Center is the most comprehensive shooting facility in America today. In 2007 the Whittington Center was visited by over 183,000 unique visitors. Events in 2007 included clinics, tournaments, matches, guided and unguided hunts, nature trail rides, and Adventure Camp for junior outdoors enthusiasts. United Way of Pueblo County exists to develop donor resources to enhance the quality of life for the people of Pueblo County. United Way of Pueblo County is autonomous, directing our own course based on community needs and the direction given by our governing board. The spirit of philanthropic giving began in Pueblo in 1923 when community leaders raised $105,000 by going door-to-door. It was known first as the Community Chest, then the United Fund and now, United Way. While the name changed, the mission remained constant--to raise funds whereby donors could give to a single effort and help support the array of needed and critical services in our community. There are many charities in the Colorado area which can benefit from your vehicle donation. We not only help you donate to a charity, but we focus on providing local non-profits that are small with an easy way so that they can concentrate on their work that is important to take donations. The donation will make the biggest difference for charities, like United Way of Pueblo County, while helping support those in their Pueblo, Colorado community who need it the most bringing folks together. Car donations are the most responsible way for folks to make a sizable donation. Due to this, one of our aims is to enable those making a decision by making sure that the car, such as your Kia Forte, goes to the charity that reflects their values. When donating together with us we consistently make charity choice an integral part of the procedure. We could do that too, in case you would like us to decide which charity would be helped the most rather. It is important to Instant Car Donation that you receive the allowable tax deduction advantage without needing execute research or to navigate complexities possible. We pre-qualify all our participating 501-3C non-profit charities to verify your donation will be tax deductible. The procedure will be streamlined to both you and the charity of your choice. We'll provide you after your finished donation. If you've got a charity in mind you want to contribute to, then you can donate with us. When there are numerous benefits to charities that receive donations from people, the advantages to the you, the donor may not be too clear. The biggest advantage which the majority of folks hear is the opportunity for a tax benefit. There are some limits on this sort of deduction, which means you could choose to talk to a tax pro prior to making the donation. One more advantage of donating a secondhand car to charity would be the opportunity to just get rid of the automobile without having to try to repair or sell it. Most charitable automobile donation plans will except vehicles if they're operating in need of repair. Some cars or trucks which are beyond repair will be sold for parts or scrap along with any money received will go to the charity. Car donation programs are becoming more popular in Colorado over the previous decade or so, as more charities are looking for new and creative approaches to create funds. Nowadays, the amount of charitable automobile donation programs is in the hundreds or perhaps tens of thousands. When you've got a favorite Pueblo charity you like to make donations to, it's most likely possible for this charity to receive at least a portion of the funds if you donate your used vehicle. Besides the charitable tax deduction rather than with the hassle of handling an old car, like a smart smart, the feeling of having the ability to assist those in need may be the very best reason to give your vehicle to a charity. Most used car donation programs will either sell the vehicle to raise funds for the reason, utilize the vehicle in the daily operations of the organization, or give the vehicle to a somebody in need either for free, or even for under the fair market value. Charitable car donation programs enable you to give your used auto to the charity of your own choice. Visit our charities page to locate a charity in Colorado to donate to. When you decide to create a donation of a used car, such as your Chevrolet El Camino, when the charity sells the automobile for over $500 they are required to send you a receipt which allows you to deduct the sales cost of the vehicle, like a Saab 9-7X, in your own tax return. If the older car you opted to donate isn't worth at least 500 bucks, then the IRS lets you determine the reasonable market value. This is actually the value that someone would be ready to pay for the vehicle, like a Lancia Thema, if buying it from you. So as to claim the tax deduction, then you'll have to itemize your deductions on your tax return. Using this method, you get out by getting rid of your used car, truck, RV, motorcycle, or other vehicle, without needing to market it in Pueblo. You claim the tax benefit, and the charity gets to utilize the automobile sells it and uses the proceeds for the good of the charity. That's a wonderful thing for everyone involved. Is there a financial tax deduction for donating my car in Colorado? We can ensure your vehicle, such as your Mercedes-Benz 500, goes to a charity which is qualified help you recieve a reciept for the contribution and for tax deductible donations. If you itemize your deductions you may be able to have a tax advantage. For contributions around $500 you're able to use Kelley Blue Book and also for bigger contributions the charity must verify what they recieved for the automobile donation (more info). How will my car be sent to the Pueblo charity? 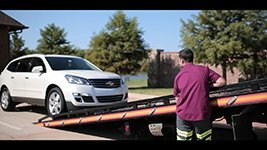 We'll organize a tow truck to come get your car and deliver it for you. It couldn't be much easier to help the non-profit organization of your choice today! Do you take donations for cars that are missing or damaged parts? Certainly, we take automobiles in all states! Go to the form and ask to donate, and we will quickly see what we can do. Can you help me locate a Pueblo non-profit organization that suits my personal values? We'd like to assist you make sure that your donation goes to your cause in Pueblo you care about by assisting you to pick a charity, like United Way of Pueblo County, that fulfills your values. It is so important to us we do so each time you contribute with us! Who can I donate my automobile to in Pueblo? Instant Car Donation proudly supports many respected national and local Pueblo organizations that are nonprofit in the area. Our Pueblo team works with dedictation for you to ensure the organizaion recieves support from your automobile. All owners on the title must complete the section of this title labeled "assignment of title by owner" or "transfer of ownership by seller". Most states require signing and printing owner names. You need to fill out any areas that require documentation concerning a buyer/purchaser/transferee with information. Detailed instructions may be found by you for your house state here. Will my donation be finished fast? First we'll get in touch with the charity of your choice (or select one for you whether you requested that rather than picked) to make certain they want your own vehicle which takes about one business day. After that wewill arrange to come for easy pickup. When it's taking a little more time don't hesitate to contact our support team. Junk is out, easy living is in. Most of us are around our ears in things, and a few people are attempting to do something about it! We're doing things such as taking our clothing to Buffalo Exchange or giving up on purchasing new things for the time being and seeking to make do with what we've. Who would have ever believed that many Americans would give up their homes and build tiny efficient ones rather? It is not having things the thing which brings us happiness. It's what we do with all what we have that matters. We might have considered donating clothing or house products to a local charity, however we might not have understood just how much a charity, like United Way of Pueblo County from Pueblo, Colorado, might gain from the donation of a vehicle, such as a EV Innovations Motorcycle Wave. If we haven't thought about it, we should take a moment to reflect how much charities, like United Way of Pueblo County in Pueblo, Colorado, are fighting to make ends meet, or even to fund applications that further their mission. Do you have an unused or unnecessary car, like a Falcon F-7, carrying space in your garage or driveway? Have you thought about if there is a better use on the car than simply sitting up there, cluttering up your space? We can assist you downsize, and also do something great for your neighborhood community. Have a peek at our site. However, the pages of the website are listed tens of thousands of charities, such as Fidelco Guide Dog Foundation. There is guaranteed to be just one in Pueblo, Colorado or the community area that talks to you, whose assignment that you feel is worth supporting. Or, if there's a particular charity which you wish you give a supporting hand you can let us know the name of the charity and we'll contact them for you, to make sure that they can receive your donation. Instantcardonation.org is a website that may enable you to help a charity that speaks to a heart, and enable you to simplify your life. It will not cost you anything --you only have to take a moment or 2 to press the donate button and then send us any information regarding the vehicle you wish to donate, like a Maybach Maybach. We'll arrange a free pickup for your vehicle in Pueblo or the regional area, and list on the auction to acquire the maximum price possible so that we can make the maximum donation potential to the charity of your choice, likeUnited Way of Pueblo County. Not only would you get to donate your vehicle from the heart, but you're also eligible for a tax-deduction. We'll finish your tax receipt and supply the non-profit with desired IRS paperwork in addition to your contribution. Giving from the center couldn't be easier! Have you wondered about donating your car to your charity? It may well not be as easy as you believe. Most charities, such as United Way of Pueblo County in Pueblo, Colorado are not equipped to take care of car donations, because it takes them to employ staff to take in the vehicle, evaluate it, sell it, then do most the paperwork and accounting. By this time this process is finished, the actual monetary donation to the nonprofit may be very small after paying for each one the overhead. Let us at instantcardonation.com help. We make it quite easy for any nearby charity, such as for instance United Way of Pueblo County in Pueblo, Colorado to possess their very own vehicle donation application because we eradicate all the hassle. When a nonprofit, such as for example United Way of Pueblo County at Pueblo, Colorado partners with Instant Automobile Donation, they be given a full sized car donation plan. We take good care of everything and are able to simply give your charity a donation assessed with all the essential paperwork done from the ingestion and purchase of each vehicle. Our process is straightforward. We'll take any car, such as for instance smart smart. Just fill out an intake form. Afterward, we'll contact you to verify your car donation. Next, we'll ship a tow truck to pick your car up within two days. From that point, we take care of every thing. We'll fix up the car and sell it to your maximum value, in order for your donation is going to soon be maximized, or if it really isn't worth mending up we'll sell it is. It is a Winwin. The hassle of owning their very own car donation program isn't always worth it to get local charities, however if individuals take care of all the heavy lifting, then it's a great source of fundraising to get nonprofits. We help might help local charities like United Way of Pueblo County from Pueblo, Colorado and larger charities such as The Wetlands Initiative. By way of example, your donation will help United Way of Pueblo County in Pueblo, Colorado to further their assignment. This kind of fundraising service permits charities like United Way of Pueblo County in Pueblo, Colorado to focus their time and energy on exactly what they truly are best in: helping others. For those who get a neighborhood charity, then such as United Way of Pueblo County at Pueblo, Colorado that you'd really like to help and also have a car, like a Ferrari 360 Modena/360 Modena F1 to donate, then simply fill in and intake now and we'll be sure that you are able to make the most out of your contribution. Additionally, in case you don't see your favorite charity on the website, then feel free to send our website information into your charity and also request that they join our app. Alternatively, you may reach out to us at info@instantcardonation.org and we will get in touch with your charity of choice to find out if they would like to own their particular car donation plan that's totally managed by people. Spread the word and make your beloved local nonprofit, United Way of Pueblo County at Pueblo, Colorado prefer to increase their own fundraising and reach their own goals with their particular car donation system! There are many reasons people contribute cars, such as a Toyota Sienna. Some of us don't have enough time or inclination to sell an automobile that's only sitting in the driveway or the garage. A lot do not have a lot of cash available to support our preferred respected charity in Pueblo, and that is our opportunity to use to accomplish something enormous to support their important work in the community. Along with such causes, a fantastic many folks donate ELVs, otherwise called End of Life Vehicles. Once we grow ourselves, and even confront the departure of our family and nearest and dearest, donating an automobile such as a Toyota PRIUS into the charity of our heart is really a gift that we can give ourselves and our area from Pueblo or our regional area. We may have gotten to this point in our lives where we just are not driving our car any longer. What better usage will we create of our car than to put it to use to impact our community? Especially small and medium nonprofits like United Way of Pueblo County at Pueblo, Colorado, really rely upon the aid of their community to continue their work. Should we choose to donate our car into a charity like United Way of Pueblo County, whose mission we all truly have confidence in, we provide them the gift of unexpected funding to encourage an present program to help them develop new programs and extend their outreach. Donating our car may be gift we give ourselves. A number of us will also be in the position of taking care of their estates of their nearest and dearest and putting their last wishes into actions. In this case we might decide to donate their vehicle to an underlying reason they believed in during their lifetime. Irrespective of what it was that spoke with their own heart, we are guaranteed to find a way to locate a worthy charity that would help bring their fantasies and thoughts for a better world to fruition. Helping them to contribute their own car may be gift we provide them. Regardless of why you're thinking of donating your car, we could help. The point that seems most significant to people considering donating their motor vehicle is to be certain the donation goes into a charity that they really believe in, such as Union Gospel Mission, Sacramento. We have achieved to thousands of charities in Pueblo and beyond, whose names and profiles are around our website. We partner with them to make sure they can accept your car donation. Additionally, if there's just a charity you want to subscribe to who's not listed here, then we're eager to contact them for you personally on your own behalf. We'll arrange a no cost pick-up of your car, help you transfer your name, and get the non-profit of one's own choice, like Rancho Cielo Youth Campus, to ensure they receive your donation. We'll also make sure that you have the paper work that you want come tax time to get the maximum tax donation. Have you got a vehicle, like a Infiniti G20, just sitting in your garage or in your driveway that you have been intending to get rid of? Maybe you think it is too outdated, or that it's in need of repair or refurbishing. A lot of us are willing to depart an unneeded automobile sitting in our garage or our driveway for years without spending time or cash to repair it. So that automobile sits, and sits and sits. Let's be honest. Are we likely to put in time and money to fix that car? If we were, would not we have done it already? Not only is this older car an eyesore, but we're also overlooking the opportunity to use this precious resource to assist a charity like The Huntington Library, Art Collections, and Botanical Gardens! One man's crap is another person's treasure, or so the saying goes. This is certainly the case with car donations. A vehicle, like a Nissan Altra, which is unnecessary by you might provide just the correct amount of funding to a charity in Pueblo or outside to fulfill its budget for a present or future project. When you donate your vehicle, you're giving a precious treasure to some charity, because your donation helps them to keep their important work locally. United Way of Pueblo County in Pueblo, Colorado is this a nonprofit. Its call to action is directly supported by your contribution--you can enable the charity of your choice, such as United Way of Pueblo County, to expand the breadth and reach of the good actions from the local community! We pride ourselves in assisting you to convert your unwanted auto to actual treasure! Click on the donate button now to begin the procedure. After you let us know which you are ready to donate your vehicle, we'll arrange to get a free pickup in Pueblo or your regional region and sell your vehicle. All you have to do is tell us which respected charity meets the phone of your heart, and we'll finish up. The very best part is that while you receive the advantage of clearing out old, unnecessary crap, you get to give financing to the charity of your own choice, like Special Olympics Nebraska, and ultimately, you receive the maximum tax advantage for your donation. We'll provide you with a tax receipt for your donation, and also ensure that the charity of your choice receives the donation as well as the necessary IRS paperwork to accept your donation.